Yosemite faced a number of challenging events in 2018, including floods and fires, but fortunately serious rockfalls were not among them. 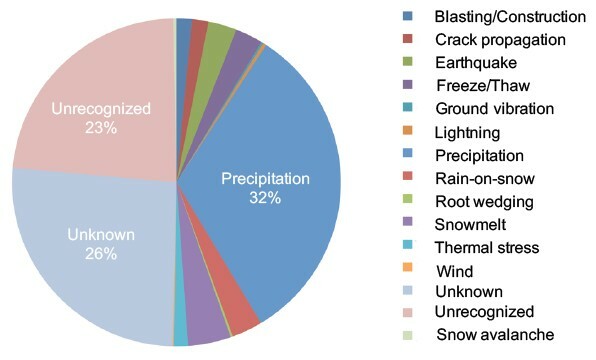 Forty-one events (including rockfalls, rockslides, and debris flows) were documented in 2018, below the recent (2006-2017) average of 53 events per year, and less than half of that documented in 2017. Rockfalls in 2018 had a cumulative volume of about 2,220 cubic meters (6,610 tons), also well below the recent average of 10,068 cubic meters (about 30,000 tons). The largest rockfall of 2018 was not in Yosemite Valley, but instead occurred deep within the Grand Canyon of the Tuolumne, between Muir Gorge and Pate Valley. It likely occurred sometime in March with the first real winter storms, but it wasn’t reported until the trail was accessible in early summer. Approximately 1,500 cubic meters (4,465 tons) of rock slid off the north wall of the canyon, spreading out over the canyon bottom and burying the trail under large boulders and trees. Clearing the trail of this debris was a summertime priority for trail crews. The most consequential rockfall of 2018 was a relatively small rockfall from the northwest face of Half Dome. On the morning of June 5, a thin exfoliation slab of about 5 cubic meters (15 tons) fell from the east side of the face, breaking into many small fragments that funneled down a steep gully containing the lower pitches of the Regular Northwest Face climbing route. The debris struck a climbing party on the third pitch, causing a neck laceration and possible dislocated shoulder. The climber’s helmets sustained significant damage, suggesting, once again, that wearing helmets probably saved lives. The injured climbers rappelled to the base of the route and were evacuated by helicopter. Other substantial rockfalls in 2018 occurred at Parkline, El Capitan, Indian Canyon, the south face of Half Dome, and Quarter Domes. It is very likely that there were additional rockfalls and rockslides in 2018, but these events either were not witnessed or went unreported. If you witness a rockfall of any size, encounter fresh rock debris, or hear cracking or popping sounds emanating from the cliffs, please contact park geologist Greg Stock at 209/379-1420 or by email at greg_stock@nps.gov, or contact Park Dispatch by dialing 911 within the park. Documented rockfalls are added to the park database (http://pubs.usgs.gov/ds/746/ ), enabling long-term evaluation of rockfall activity to improve public safety. Are there any dumbed down charts out there for us laypeople? Here is a simple plot of rockfalls by month for all of Yosemite NP (1857-2011). The rockfall inventory database that I linked to above can be easily sorted by location, so you can make a similar plot for whatever area in Yosemite you are interested in. I should point out again that the database is prone to observer bias, so some remote areas may show few rockfalls in the winter, but that could be due to a lack of documentation rather than an actual lack of events. super cool, thank you for sharing the knowledge! Does that chart change significantly if you look at the last twenty years versus the long term that you have here? I haven't yet replotted the data up to the end of 2018, but generally speaking additional data don't change the overall picture - there are a few more rockfalls in the winter months, a few less in the summer months, but overall there is not a pronounced "rockfall season". This is because there are a number of different environmental triggers for rockfalls that operate throughout the year. I know this request will lead people here to conclude geologists cause rock fall. I am, however, willing to testify under oath I have never seen you carrying a crowbar in your hammer holster. The data is interesting. Perhaps March has the highest rockfall because of freeze thaw cycles that tend towards making more runoff. May is high because that period exhibit the highest runoff. Perhaps by June, flows stabilize. Why does June exhibit the lowest rock fall? Perhaps the relatively high July falls result from the highest solar insolation and resulting thermal expansion of the rock. Then as winter comes there are more freeze than cyclists. I expected to see a graph that showed a much stronger correlation to freeze than. The July high is quite interesting. It's possible that there are more people to observe rockfall in July. These observations are from an engineering geologist. Perhaps the increase in October rockfall is how the month got the nickname "rocktober." (1) Freeze-thaw accounts for a surprisingly small number of rockfalls in the inventory database. We modeled the temperatures at the Valley floor and rim leading up to and during all rockfalls, and only about 7% occurred within the freeze-thaw window. March is more important for cumulative precipitation I think. (2) I agree there are more rockfalls later in the summer because the rock is hotter. Our 2016 paper on thermal stress triggering shows the rock heating up progressively throughout the summer, leading to larger expansions of the monitored rock flake. (3) The thermal stress triggering paper also lays out how the daily flake deformations, driven by heating and cooling, work to destabilize flakes throughout the summer. I think this is why the first rains in September and October tend to trigger more rockfalls than similar or even larger storms later in the winter. earth tremors, underground, as well??? Thanks, Greg - always interesting. Your talk at the Facelift some years ago was one of the best 'natural history' talks we've ever had. So much for the theory that it's caused by PTPP. Thanks Greg, always fascinated by the info you share. I'm another huge admirer of both the science and the applications of what you do. You still have a ton of study yet to go, given that the pie chart above shows half - fully HALF - of the rockfall causes as unrecognized/unknown. Gravity happens! Edit: Is there a chart or table summarizing the type of granite or granidiorite or rock that rock falls come off of? Mainly I'd like some actual data to back up my "that cliff looks like crumbly rock" thoughts as I scout areas. You still have a ton of study yet to go--understatement of the day!!!!!!!!!!!!!!!!!!!! Thanks for the kind words. There is indeed still a ton of interesting work to do, especially in that intriguing "unrecognized" category. We have taken a stab at evaluating how rock type affects rockfall frequency and volume. 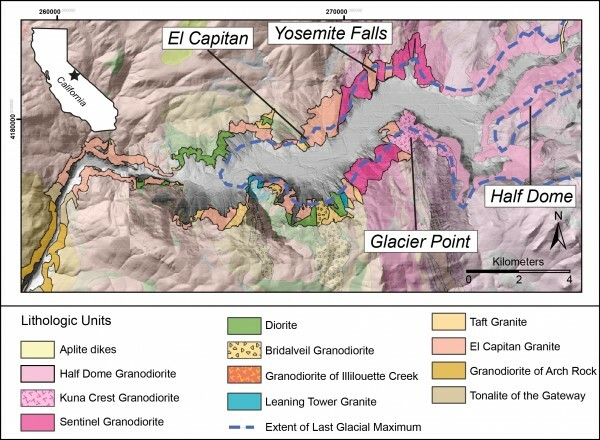 The first image below shows the various rock types in and around Yosemite Valley, and their brighter-colored outcrop areas for rockfall-prone cliffs (slopes >60 degrees). We can then look at the number of historical rockfalls from cliffs of each rock type, as well as the total volume of rockfalls from each rock type. In order to meaningfully compare these, we have to normalize by cliff area and year. 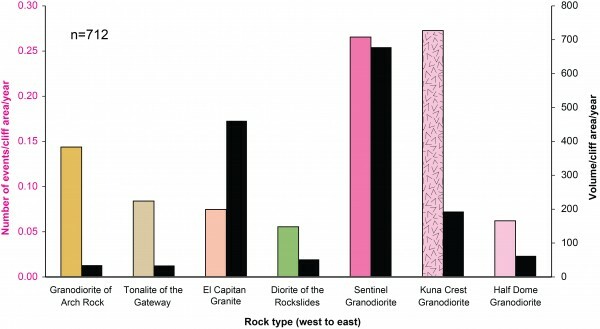 Those results are shown below; colored bars represent the number of rockfalls, black bars represent volumes. Overall, the Sentinel Granodiorite comes out the "winner", in terms of having the greatest number of rockfalls and the largest rockfall volume per unit cliff area. I don't really know why this is, but I can say that the Sentinel Granodiorite has the strongest foliation (mineral alignment that forms a kind of layering, possibly due to frictional drag on viscous magma by the wall rocks) of any Yosemite Valley rock type. It is also likely that the extent of the most recent glaciation (Last Glacial Maximum) about 20,000 years ago also plays a role, as cliffs that were glaciated were largely swept clean of weathered rock and hence are less prone to rockfalls. This may explain why the rocks in the Merced Gorge (like the Granodiorite of Arch Rock), which are outside of the glacial extent, have a relatively high number of rockfalls. I should also add that we haven't gotten down to the level of small outcrops like the North America Diorite of El Capitan, but I think simply based on the concavities within the NA Diorite areas of the cliff it is safe to say that diorite produces a lot of rockfalls. Regarding the recent (4 February 2019, 9:23 am) rockfall from Sentinel Rock, I don't yet have a good volume estimate. Soon after the rockfall occurred the cliff was obscured in clouds, and then had about 3 feet of snow plastered over it. It may be several weeks before enough snow melts to get a good look at it. But I would guess that it was a couple of hundred cubic meters. Looks like the Four-Mile Trail took a direct hit. Is there any place we can look up recent rockfalls on El Capitan? It would be nice to know which routes may have been altered within the last year. Awesome, thanks for taking the time for that response!